1The book of the genealogy of Jesus Christ, the son of David, the son of Abraham. 2Abraham was the father of Isaac, and Isaac the father of Jacob, and Jacob the father of Judah and his brothers, 3and Judah the father of Perez and Zerah by Tamar, and Perez the father of Hezron, and Hezron the father of Ram, 4and Ram the father of Amminadab, and Amminadab the father of Nahshon, and Nahshon the father of Salmon, 5and Salmon the father of Boaz by Rahab, and Boaz the father of Obed by Ruth, and Obed the father of Jesse, 6and Jesse the father of David the king. My friends, welcome to this week’s Prayers for the Week post. 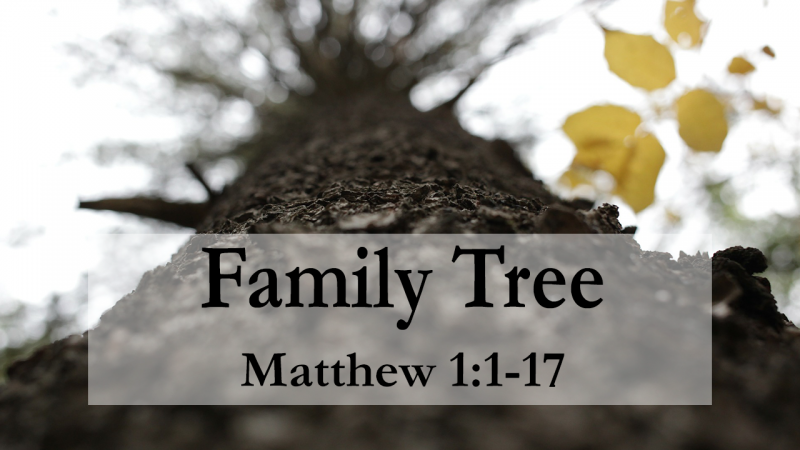 Today I thought a lot about how unique we all are, and that got me to thinking a bit about Jesus and His family tree. So today, let’s talk about what some of those that came before Him, and compare their lives with some of the things we do sometimes. Judah unknowing slept with his daughter-in-law Tamar, producing the twins Perez and Zerah. Rahab was known as Rahab the Harlot before she helped the two spies. One of them, Salmon, loved her, married her, and they produced Boaz. David was King — but he slept with his friend Uriah’s wife Bathsheba, and when she became pregnant with Solomon, had Uriah killed. Solomon had more wisdom than any man of his time or since — with the exception, perhaps, of Jesus. However, Solomon turned from what God wanted of him, and the sad result of Solomon was that his kingdom was divided. Uzziah was made King of Judah at the age of 16, and rose greatly, because he walked with God. But later on, after he was strong, he turned away from God, and God struck him with Leprosy, and Uzziah died. The point of all of this, my brothers and sisters in Christ, is to point out that the genealogy of our Lord and Savior, Jesus Christ, is littered with people that made mistakes — huge mistakes in some cases. For some of them, they started their lives walking with God and turned away later, and for others, they started their lives walking away from God and turned toward Him later. From my perspective, the big key for all of us is that we all make our own choices — choices to either follow God or to not follow Him. The beauty of it all is that God is long-suffering, and He wants everyone to come to Him, and for all to be saved! The answer to that question will determine where you will spend Eternity. Choose wisely. Now, please read along and pray with us our prayer requests and praises. We start off today with a prayer request for the family and friends of Officer Mumaw of the Nashville Police Department. Here is what Shannan had on her page: These are the words of the Mayor: Our worst fears were realized today when Officer Mumaw was recovered deceased from the Cumberland River after having given his life to save a woman in distress. Officer Mumaw dedicated his life to the safety and protection of us all, and today he gave his life to that calling. My thoughts and prayers are with Officer Mumaw’s family and friends and all of our Metropolitan Nashville Police Department Officers today. I want to thank the men and women of our Metro Nashville Police Department and Nashville Fire Department, as well as the city of Hendersonville, Tennessee, Tennessee Highway Patrol, Tennessee Wildlife Resources Agency, and US Army Corps of Engineers who all came together this morning to assist in the search for Officer Mumaw. Updates: Our Metro Courthouse, Korean Veterans Bridge, and other buildings will be lit in blue this evening to honor Officer Mumaw. I have ordered all flags to half staff on all Metro buildings until further directed. Please pray for my friend Laurel — her mom is really sick. Here’s what she wrote: Please pray for my mom, Donna Potter. She is in the ICU with complications of her cancer. Jodi has this continuing prayer request: Please continue prayers for my FIL, who is recovering from a severe head injury. He fell/fainted(?) this morning. Checks out ok at doctor physically. He is still struggling very much with affects of this injury: cannot control emotions, is extremely impulsive, is very angry and frustrated, and is still being very mean to his wife (who has to keep reminding herself it is the injury talking). Please pray as he heals there are no long-term or permanent effects to his personality and that he has a full recovery. Thank you! Please pray for Early and her group as they head to Haiti for a medical mission trip. Also, praise for Early, her husband Chris, and their son Aidan, who is improving day by day in his environment! Please pray for Cindy’s co-worker Tommy. He has his heart surgery next Wednesday. Thanks! Lori has a prayer request: Please send Prayers up for my friend, Barb & her husband, Joe, and Joe’s father especially. Joe is wheelchair-bound with cystic fibrosis and is having to fly tomorrow (alone) to be with his father for surgery. Barb has to let him go on his own as they have 3 very, very special needs children at home that they adopted. God Bless them & their hearts! Please continue your prayers for our friend Tina in her recovery from surgery. Lynda has a prayer request: A work friend of mine and my company’s is undergoing a double mastectomy on Wednesday. Asking for lots of prayers. Update: She had the surgery, please keep praying for her good recovery! Please continue praying for Amanda’s husband Daniel and their daughter Cate: My husband’s tumor indicators are still increasing after switching chemotherapy drugs. Please pray that this chemo at least stops the cancer from spreading and growing but better yet that God cures and heals him. Please pray for his emotional and spiritual well being as well. He’s taking it pretty hard even though it’s only one indicator and isn’t always correct. There are several new treatments coming in the next several months and we need to keep the cancer in check at least until then! Thank you all so much! As always, please pray for those requests that we don’t hear anything about. The anonymous prayer requests are greater perhaps than the sands on a beach, but you know what? God knows the details of each and every one of them. He is that awesome and He loves us that much to care about the most mundane prayer requests we have. So even if you don’t think you can ask us to pray for you, know that you can still ask God directly. Remember, Jesus died on the Cross to pay the penalty for each of the sin that we all have. His sacrifice for us tore the curtain that separated us from God, and now, we can pray to God because Jesus intercedes on our behalf. Pray. It’s as simple as that. Prayer is simply talking to God, telling Him about what is going on in our lives. Pray.